Our oils are sourced from artisan distillers who know the farms and farmers where the plants are grown. The plants are the best available: organic, biodynamic, sustainably harvested, and/or wildcrafted in the most pristine regions of the Planet. No chemicals are used in the distillation process and no oils are diluted with carriers. They are bottled in violet glass to protect from damage by light. The oils are full strength and must be used cautiously. Normally one drop every 2-3 days or as needed is sufficient. With milder oils, such a lemongrass or basil, two drops per day is not unreasonable but please do not try this with thyme essential oil. are not intended for internal use. Schisandra, CO2 Processed Berries, 5 ml. Schisandra berries are very potent adaptogens that have been used for centuries to enhance stamina. By processing the berries using a CO2 extraction method, no solvents are used and the full range of chemical constituents of the berries is preserved. The concentration is extreme so most people using this oil would dilute it in fruit juice or add to a carrier to use externally to improve skin tone. As an adaptogen, schisandra is known to protect against a wide variety of stressors, such as extreme cold as well as exposure to toxins. It is particularly helpful for vision and the liver, but a popular use to protect against oxidative stress, including that which leads to inflamaation and mutations. Contents: CO2 processed Schisandra sphenanthera fruit. Sea Buckthorn, Ecocert Organic, CO2, 5 ml. This CO2 processed berry is a thick, viscous deep reddish orange color. While rich in color and antioxidants, there is not so much aroma. Most people using this product would add it to a carrier oil or cream and use it for skin care. It can also be added to a product simply to provide color and vitamins for the skin. Sea buckthorn is mentioned in ancient Tibetan medicinal books dating back more than a thousand years.The fruit oils are extremely high in betacarotene and are used to aid cellular regeneration, especially after exposure to burns whether from the sun or radiation. The texture is very smooth. The thick berry oil disperses in carriers and can be mixed with coconut oil or something very much more exotic. Contents: CO2 processed Ecocert organic Hippophae rhamnoides berries. Sweet Orange Essential Oil, organic, 5 ml. Sweet orange has a wonderful citrus aroma and blends well with many other oils. For instance, mixing it with cinnamon bark essential oil can extend the efficiency without sacrificing therapeutic value. Since the concentration needed for health benefits is very tiny, using a high quality but less expensive oil to stretch the cinnamon or cloves is practical. On its own, sweet orange is carminative and bactericidal. It blends well with others citrus oils as well as members of ginger family and nutmeg. Contents: oil expressed from peels of orange Citrus sinesis. Tarragon Essential Oil, wildcrafterd 5 ml. As with the other artemisias, Tarragon is a digestive aid and vermifuge, but Tarragon also promotes good circulation and excretion of uric acid. It is often used to reliever discomfort associated with menstruation as well as rheumatism and arthritis. Dr. Jean Valnet did extensive studies of essential oil and determined that Tarragon, often called the King of Herbs in France, has very strong antioxidant properties and is therefore effective in counteracting the action of free radicals, including those associated with malignancies and cataracts. Contents: Steam distilled leaves and flowering tops of wildcrafted Artemisia dracunculus . Tea Tree Essential Oil, Ecocert Organic, 5 ml. Tea Tree, is a very powerful antiseptic and insect repellent. It is analgesic and sedative. It is said to aid recovery from heart attacks, but mainly it is used on skin conditions, everything from acne and athlete"s foot to Candida albicans, chicken pox, herpes, and ringworm. It is antiseptic to the urinary tract and promotes flow of urine. It is a mood elevator and therefore helps combat both fatigue and depression. It combines well with cinnamon, eucalyptus, lemon, and peppermint. When using topically, a 10% solution has been shown to be quite effective. Consider adding tea tree to a carrier oil such as jojoba before applying directly to the skin. Use 12 drops per ounce of carrier. Contents: Ecocert steam distilled essential oil of certified organic Melaleuca alternifolia. Not for internal use. Not for use by women who are pregnant. Thyme can be used internally or externally. It is antimicrobial, antifungal, antioxidant, and vermifugal (especially against hookworms.) Thyme has been used for thousands of years as a culinary as well as medicinal herb. It is a common ingredient in mouthwashes and retards plaque formation and gingivitis. You can combine thyme with rosemary, lemon, or tea tree. Contents: steam distilled essential oil of certified organic Thymus vulgaris ct.linalool. Tulsi Essential Oil, certified organic, 5 ml. Holy basil is as the name suggests one of the most sacred and revered plants of India. The essential oil is used mainly to purify the mind, but it is also an excellent mosquito repellent but the useful length of protection is only about two hours. This oil is high in eugenol and can be irritating to the skin. Dilute in a carrier oil and test carefully before applying externally. It can then be used for peripheral neuropathy and relief of mild aches and pains. It is quite effective against skin infections and acne. It is also immune enhancing and antifungal. Contents: steamed distilled certified organic aerial parts of Ocimum sanctum in violet glass bottle with reducer. Turmeric Essential Oil, Ecocert, 5 ml. Turmeric essential oil is an antioxidant with probable antitumoral properties, especially with uterine cancers. It is used externally for wound cleansing and as an insect repellent. Internally, it has an action on digestion and on the gall bladder and may support expulsion of parasites. Though relaxing, it can also increase libido. It combines well with other members of the ginger family as well as citrus oils and ylang ylang. The aroma is very similar to the culinary spice. It is sacred to Durga. Contents: CO2 processed organic Curcuma longa rhizomes. Wild Oregano Essential Oil, organic, 5 ml. 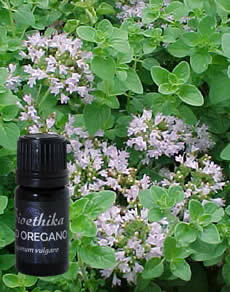 Wild oregano oil is one of the truly important essential oils. It is an excellent parasiticide and is anti-infective and antifungal. It supports immunity in the face of a host of microbes and toxins. It is very potent and is nearly always used diluted, particularly when applied externally. It should not be used during pregnancy. It can be blended with other essential oils or herbal extracts. Try it with lemon. Contents: certified organic, full strength, steam distilled essential oil of Origanum vulgare. Wintergreen Essential Oil, organic, 5 ml. Oil of wintergreen is a very well known flavoring as well as pain relieving constituent in massage oils and vapor rubs. The oil is generally added to carrier oils and used to reduce pains associated with rheumatism and arthritis. Internal use is not recommended. Contents: steam distilled aerial parts of organic Gaultheria frangrantissima. Ylang Ylang, certified organic, 5 ml. This is a highly fragrant essential oil used widely in the cosmetic industry as well as in some medicines, such as for motion sickness. However, it is best known as an aphrodisiac. It is also used as a hormone regulator. It is stimulating to the adrenals and thymus and balancing to other parts of the endocrine system. Ylang ylang can be used topically to relieve the pain of insect bites, lower fevers associated with typhoid and malaria. It blends well with ginger, lavender, and lemon. Contents: steam distilled essential oil of certified organic Cananga odorata.